BEN 2.5 ORE DI AUTONOMIA AL 100% DELLA POTENZA A 7 LED ACCESI AL 100% DELLA POTENZA! -4 modes of light: MAX brightness / NORMAL / MIN / FLASHING MODE ( MAXIMUM). Spotlight quality, fully waterproof (including battery and connectors), made of aluminum alloy and it's optimized for an excellent heat dissipation. Consists of 8x18650 Battery. 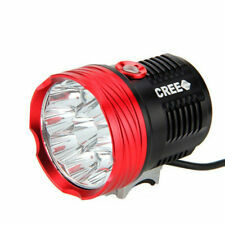 1 x 10T6 cree led Bicycle Light. Application: Can be used as Headlamp or Bicycle Light. LED: 10 x XM-L T6 LED. LED Color: White. Power Adapter Specification Switch: Light blue Button. LED type: 8 CREE XML L2. Mode: strong / weak / strobe. Reflector cup: Aluminium cup. Headlamp weight: Approx. 260g(Only headlight). Headlamp size: 8.2 4.2 4.3cm. Waterproof level: IP65. 4 switch Mode: 1x XML L2/2x XML L2 MID/3x XML L2 High/ Flashing. Model of LED: 3x XM-L L2 LED. 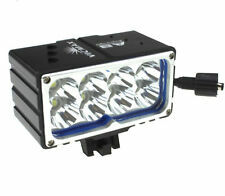 1 x 10000lm 3x XM-L L2 LED Light unit( Can be used as Headlamp or Bicycie Light ). 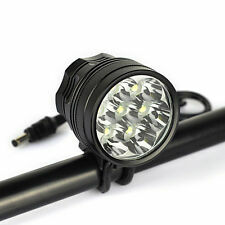 Can be used as Headlamp or Bicycie Light. Model of LED: 3 x CREE XM-L T6 extra white LED. Power > 80%. three indicating LED on. 50%< Power < 80%, two indicating LED on. Long-press the switch for more than one second to access strobe mode. Feature: -100% Brand High quality -Made 6061 T aluminum alloy, this flashlight is sturdy and durable enough for long time using daily -base lamp: high power LED. With a lifespan of up to 100,000 hours or more, no need to consider replacing the cap for the whole life. Waterproof, but do not put in the water a long time. -super bright, blinding effect. -Bisel Crenellated strike for enhanced self-defense. -3 Mode: high low Strobe (press the switch in any mode for 3 seconds in the stroboscopic mode). -Bulbo: 10x XM-L T6 LED -location Switch: Tailcap (center) green LED power. Maximum -Departure: 10000 lumens. -Energy By: 4X18650 3.6 V / 3.7 V battery . -size (Mm): 135x55 (bezel) / 50 (body) mm. -Weight Net (g): 350. Package includes: 100% Brand New 1x XM-L T6 LED Flashlight. This item is -T6 flashlight bike mount,if you want to choose 2 flashlight bike mount. Opiton G:1 L2 Flashlight 1 Bike Mount. Lamp beads: T6/L2. if you want to choose COB 2 Flashlight bike mount. Mode: 5 modes Hi > Low > Strobe.